Bixby frees you to focus on what matters the most. It learns what you like to do and works with your favourite apps and services to help you get more done. * Screen images simulated for illustrative purposes. * Available on Galaxy S9/S9+/Note8/S8/S8+ and Samsung Smartphones with Android O 8.0 or above. Bixby helps you remember it all. Set up smart reminders to get notified when and where you need to. You can even link websites, videos, photos and more. When you create a new reminder with Bixby, you can set a specific time and location for delivery, so you’ll get it when you need it. Bixby makes sure you won't forget what's important to you. Go beyond standard to-dos with reminders that include content like emails, texts, photos, and links. Bixby can even remind you to resume a video exactly where you left off. Create reminders in a snap. 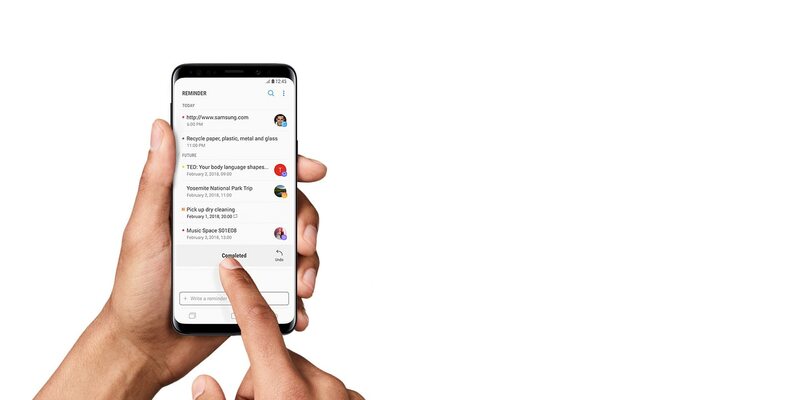 Bixby works seamlessly with your phone apps and share menu, so you can talk, type or tap to create a reminder. Use Bixby to create complex reminders just by speaking. So if you say, “Bixby, remind me to pick up milk, eggs, and nappies when I leave work," Bixby will promptly create a reminder and send you an alert when you finish work. * Bixby only recognises certain accents and dialects of English (UK), English (US), French (France), German, Italian, Korean, Mandarin Chinese, and Spanish (Spain). Other languages to be supported. Set Bixby reminders for content such as texts, photos, and links straight from selected apps with a share menu. Set reminders in apps like Phone and Messenger so you won’t forget what you need or who you need it from. Manually set reminders by typing it directly into the Reminder app. Accessible reminders make it easy to remember the little things. Check the reminders that are most relevant by swiping to Bixby and mark them complete. If a reminder has content attached, Bixby will take you directly to that app. Store the Reminder widget on your home screen – it shows your upcoming reminders and takes you to them in the Reminder app. The Always On display lets you see the most pressing reminders without touching your phone. Catch a glimpse at your reminders from any screen by swiping left from the right edge. From things you need to do on your phone, like remembering to watch a video, to the things you need to do, like getting milk, you can keep your important to-dos in one place.